What does a standard Second Pattern F~S knife look like? There are more variations than you can shake the proverbial stick at. Most likely this is due in part to the crossover from P-1 manufacture and using up remaining inventory. But it is far more complex than that. What we can say with surety is that the P-2 blade’s grinds now run all the way to the guard, the tablet style ricasso having been eliminated. The other major difference is that P-2 crossguards were stamped flat, without the elegant “S” shape of the P-1s. There are thin blades and heavy blades. Some blades taper rapidly like the P-1 while others are much fuller with more rounded tips. There appears to be two slightly different handle lengths. Due to different casting molds maybe? Knurling on some of the handles is extremely fine while on others it is quite coarse. The coarse handles may again be leftovers from the P-1 production line or just an overly aggressive plunge of the knurling tool. I even have one P-2 with a silver plated handle with knurling that has well defined start and stop lines, and a heat-blued blade. Most of the P-2 knurling is left ragged at both ends of the handle. 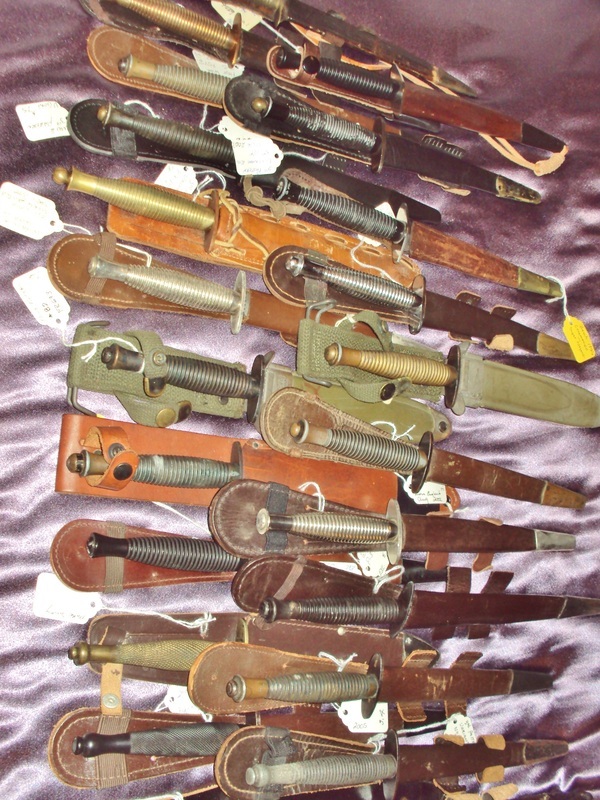 Some of the handles have the “standard” bulbous pommel while others have what is known as a “button hilt.” Several varieties of top nuts will also be found. No doubt many of the smaller items, like guards and top nuts, were manufactured through a system of cottage industries. The finishes on Second Pattern knives came in three possible configurations: all dark models, dark handles and guards with bright blades, or nickel plated handles and guards with bright blades.. I have seen all of these and no other combinations. Once we get to a discussion of “Variants” we will see all sorts of combinations. By “Bright” blades I mean un-plated, polished steel. There is a fourth version with bare brass handle and bright blade which I forgot to mention. The most desirable Second Pattern knives are those with “Wilkinson” etched blades. Now that the square ricasso had been done away with the logo could be larger and more elongated. There were many different designs of resist used to etch the logo. Knives could also be purchased privately from the Wilkinson shop on Pall Mall and, by special order, be etched with the buyers name, regiment, or whatever notation was desired. 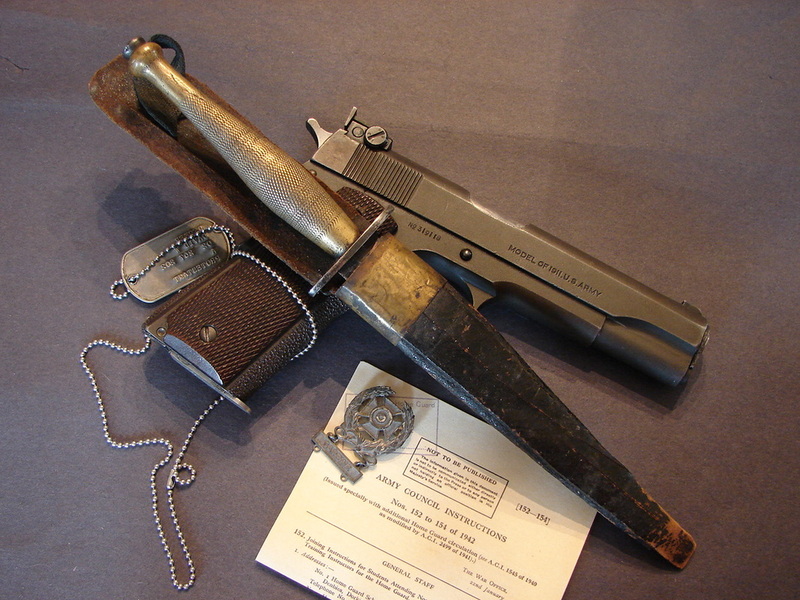 This option seems to be most commonly found on P-2 knives and less so on P-3 knives, probably because as the war ground on production was of necessity sped up. The second most sought after Second Pattern knives are those stamped with the broad arrow /l\ acceptance mark and the “B 2” inspector’s mark on the guards. They are so desirable that there is a new concern that spurious dealers may be falsely marking knives that were heretofore un-stamped. The fake B2 marks are too perfect and the ends of the letters are rounded not like a typical stamping. The high quality of these knives has been taken as an indication they were Wilkinson production as well. That has not been confirmed and some sources are suggesting they may have been made by BSA. Birmingham Small Arms co. Note: the experts have changed their minds and the B 2 knives are "most likely Wilkinson." Forgive me but sometimes its hard to keep up with the changes. As a precautionary note: Chances are that if you find a late P-2 with a rough ground, thin blade, and a “B2” stamp on the guard that it is suspect. 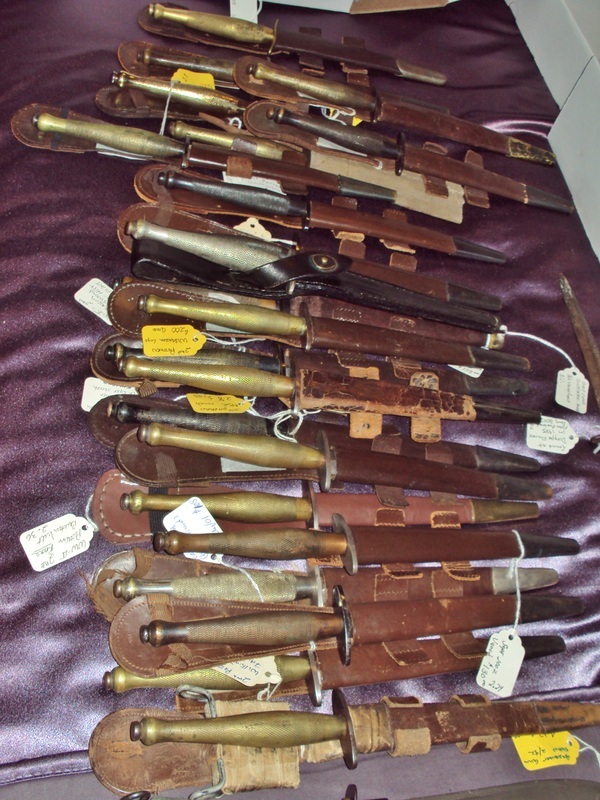 You may find knives like those just described with the broad arrow /l\ “56” stamped on them. These have thinner blades and were obviously produced by a different manufacturer than the “B2” knives. Some Speculation points toward William Rodgers manufacturing as the source of these. It was previously believed that all /l\ “I” knives were either manufactured in India, or produced in England for Indian Regiments. Like the “B2”, and “42” marked knives, all of the “I” stamped knives I have seen were of excellent quality and fitted with the heavy, forged blades. Hopefully further research will determine the manufacturer of blades so marked. In defense of the changes made to the P-1, that resulted in the P-2, from a technician’s point of view the flatter bevels on the P-2 blade made it a better cutting knife than most P-1s. This makes the knife more versatile and in some ways more effective as an all-around fighting knife. 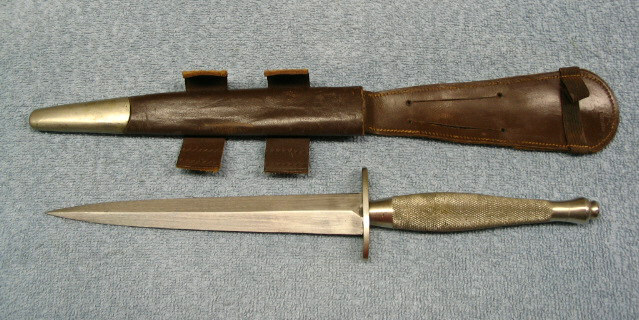 Below: this is an unusual variant of the Second Pattern known as a "Button-hilt" based on the unusually flat pommel. I have seen them made by Wilkinson but other knife makers may have used the same handle casting. The sheath is made from very thin leather that was wrapped around several times to make it thick enough. The chape is missing and the throat is reinforced with thin brass sheeting. The pistol is a Colt 1911 45 ACP. This one was made in the year 1918. This was a very popular, hard hitting weapon, favored by many American and British troops. Below: You know at some point it goes beyond a hobby and becomes an Obsession. Every one of these knives has a tag describing its condition, where and when I bought it, what I paid for it, and any other pertinent notes. This information becomes more valuable as time passes and I forget the details. I have also logged every knife in my computer to make it easier to maintain an inventory of my collection. The dollar value is staggering. Many of these knives came out of Canada. The collection will eventually pass to my daughter and the notes will be an invaluable reference for her.